Justin Drew Bieber (/ˈbiːbər/; born Mairch 1, 1994) is a Canadian sangster an songwriter. Efter a talent manager discovered him throu his YouTube videos coverin sangs in 2008 an signed tae RBMG, Bieber released his debut EP, My World, in late 2009. It wis certified Platinum in the U.S. He acame the first airtist tae hae seiven sangs frae a debut record chart on the Billboard Hot 100. Bieber released his first full-lenth studio album, My World 2.0, in 2010. It debuted at or near nummer ane in several countries, wis certified triple Platinum in the U.S., an contained his single "Baby". 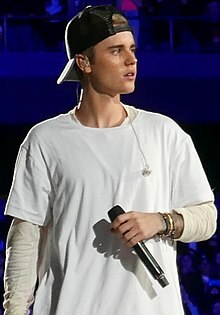 Follaein his debut album, he haed his first heidlinin tour, the My World Tour, released the remix albums My Worlds Acoustic an Never Say Never – The Remixes—an the 3D biopic-concert film Justin Bieber: Never Say Never. He released his seicont studio album, Under the Mistletoe, in November 2011, when it debuted at nummer ane on the Billboard 200. Bieber released his third studio album, Believe, in 2012. His fowert studio album Purpose wis released in November 2015, spawnin three nummer ane singles: "What Do You Mean? ", "Sorry", an "Love Yourself". His U.S. album an singles sales tot 44.7 million. He haes sold an estimatit 100 million records, makin him ane o the warld’s best-sellin muisic airtists. Bieber haes wan numerous awairds, includin the American Music Award for Artist o the Year in 2010 an 2012. In his career, he haes won ane Grammy Awaird for Best Dance Recording for the sang "Where Are Ü Now" at the 2016 ceremony. He haes been leetit fower times bi Forbes magazine amang the tap ten maist pouerfu celebrities in the warld in 2011, 2012, an 2013. Bieber an aa became the first airtist tae surpass 10 billion tot video views on Vevo. ↑ "Justin Bieber Biography & Awards". Billboard. Retrieved June 15, 2010. ↑ Collar, Matt; Leahey, Andrew. "Justin Bieber: Overview". AllMusic. Rovi. Retrieved October 21, 2009. ↑ Mitchell, Gail (April 28, 2009). "Usher Introduces Teen Singer Justin Bieber". Billboard. Prometheus Global Media. Retrieved July 23, 2009. ↑ "Justin Bieber Biography". The Biography Channel. A+E Networks. Retrieved July 6, 2013. ↑ "Inogolo - English Pronunciation Guide to the Names of People, Places, and Stuff - Justin Bieber". Retrieved January 31, 2015. ↑ "Justin Bieber Fever Hits Miami". CBS News. CBS Corporation. February 5, 2010. Retrieved March 27, 2010. ↑ Lipshutz, Jason (August 27, 2015). "Justin Bieber, on the Comeback Trail, Back in 'Good Graces' of Fans and Industry". Billboard. Prometheus Global Media. Retrieved August 27, 2015. ↑ Garavelli, Dani (January 26, 2014). "Justin Bieber in meltdown? You better Belieber it". The Scotsman. Retrieved May 13, 2016. ↑ Kilkenny, Carmel (May 16, 2016). "Justin Bieber live in Canadian homecoming". Radio Canada International. Retrieved August 10, 2016. ↑ "Justin Bieber Is the First Artist to Crack 10 Billion Views on Vevo". Billboard. Retrieved March 28, 2016. This page wis last eeditit on 30 Mairch 2018, at 20:40.